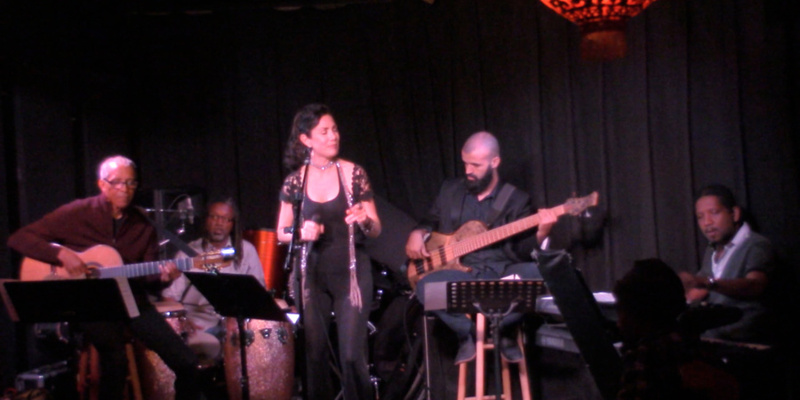 I love playing concerts with the full band at one of my favourite music venues in Los Angeles – the famous singer-songwriter club Genghis Cohen. It is primarily a Chinese restaurant but it has a lovely, separate music room with a stage, lighting and a backline. I usually perform there every two months and often try out new songs, like in February, I presented my new single, Ma Solitude. Naturally, I always play songs from my latest album, Ipanema Lounge (2016) and a include a few from The World I Am Livings In (2013). Genghis Cohen is a Hollywood staple and has now been around for 35 years. That’s a long time for the fast-moving and ever-evolving restaurant scene but also for a music club. I always look forward to being there. The atmosphere is very artist friendly and some of my favourite sound people work there. Over the years, I have played there with different musicians and in various constellations. And sometimes, mostly by chance, I have even met stars like Jackson Browne, Stevie Wonder and most recently Annie Lennox, who was there to see her daughter, Lola Lennox perform. The original owner, Allan Rinde, opened Genghis Cohen in 1983. He was Jewish, hence the “Cohen”. He had been a staple in the music industry for decades. I luckily got to meet him on many an occasion, occasionally dropping in even after he sold the restaurant 15 years later. Allan was a former publicist, a journalist, the West Coast Editor of Cashbox. He sadly passed away suddenly on December 16, 2012. Allan was head of West Coast A&R at Columbia, where he was behind Billy Joel’s first hit, “Piano Man,” and he was the man who helped break the Jesus Christ Superstar album. A close friend and colleague, the songwriter and producer Artie Wayne, who had over 250 covers recorded by such artists as Michael Jackson, Aretha Franklin, and Tony Orlando wrote a wonderful blog post here, covering years of insider stories in and around Genghis Cohen, their years in the music industry and of course many celebrity encounters. In 1998 Allan sold the restaurant to Raymond Kiu, who had been a waiter at the restaurant for 14 years. After his death, his son Denis Kiu took over, who however, died prematurely, at the age of only 43 of a heart attack. A lot has changed in the last few years but that said, atmospherically, not that much. The music room is only one part of the complex that consists of the restaurant, the bar area and the closed off music room. The restaurant section sports red leather booths, dim lighting, red accent walls. There’s a bit of Old Hollywood charm, along with self-conscious kitsch — that has however, slightly diminished since the most recent restauranteurs took over in 2015.